I realized I never posted this masterpiece here. After ordering this sword around last January I recieved it in November. When I pulled it out of the box I realized this sword is my perfect match. A wide, broad blade with excellent cutting ability and a midrib for thrusting. 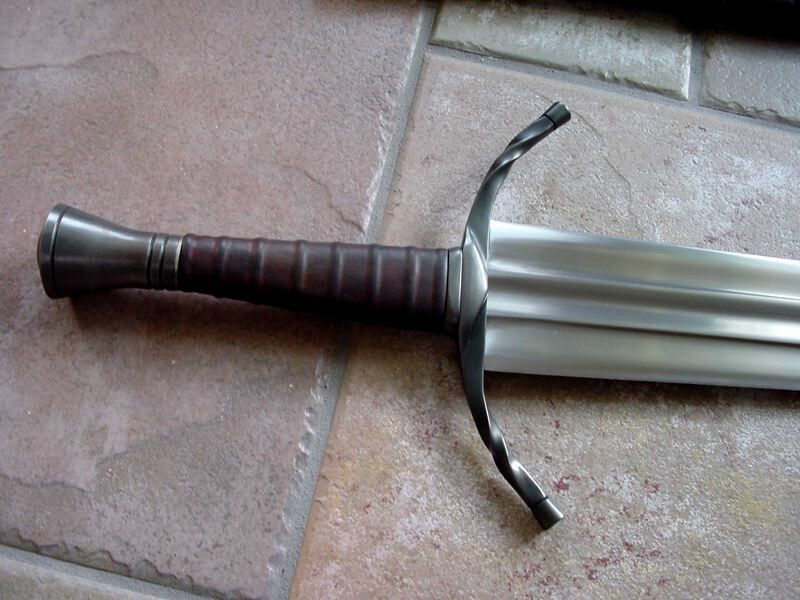 This sword is not an exact copy of the movie sword, but it is very easy to tell where the inspiration is from. I was immediately taken back immediately by the quality of the sword. The lines, the grinds, the polish, the tight fit of the hilt components, everything is practically flawless while still having a hand forged finish. The ridge of the fuller is very pronounced, and the hollow grind (not a true hollow grind, more of a triple fuller because the grind doesn't continue to the edge) makes this sword very easy to manuver with one or two hands. I would place the weight at slightly over 3 pounds. POB is about 4 inches out, and the blade at the base is 3 inches wide. I decided to get a wooden scabbard for the sword and I am glad i did, it fits the sword flawlessly, no rattling at all. He even did some filework on the chape. John Lundemo is an often overlooked sword smith and has extremely competitive prices for his swords. I would love to see him make more historical style blades because so many people interested in his swords usually go for fantasy style blades. When I can afford it I want to get a pattern welded viking sword from him, but now is not the greatest time seeing that I want to get a new car. Cool sword. I particularly like the complex blade. It's very creative. Here are some comments previously posted about the same sword. Two things: I moved your topic to "Off-topic" as it doesn't discuss historical arms and armour. Also, please note that our software lets you attach multiple images to each post. You aren't limited to a single attachment like with some software. Reading your comments about his abilities makes me want to mention how intrigued I am with his skill at making various curved blades. He's done some fantastic work on his "Warder" fantasy creations that have attracted me since I first saw them. I'd love to have him create a historically-based Swiss or Hungarian-style saber or something similar. Some of the ones I have in mind have some complex and subtle, but beautiful, blade geometry that would be very nice to see recreated. The only part of your statement I'd disagree with is this: "John Lundemo is an often overlooked sword smith ". John seems to be getting a lot of exposure these days, and is hardly overlooked. I'm very intrigued by his work and have come close to placing an order with him on more than one occasion. He definitely has talent. Looks a little bit like the Sovereign from Albions Next gen.
Hi Patrick, I should have clarified what I meant. He is not overlooked as in he is not busy and doesn't do much with his time except create a sword every now and then, but unfortunately it seems about 80% of his swords are fantasy based and I think he is overlooked as a serious bladesmith who can create some fascinatingly beautiful historical pieces. After I ordered my sword he did a thread on how he somewhat disappointed that all he ever really does is fantasy pieces (I think one was a 4 inch wide bladed super spatha). That almost made me change my order, but i wasn't certain if he had started on mine yet or at least purchased the materials for it, so I decided to stay with it. John Lundemo recieves a lot of praise. Much more than many other smiths. I never said he didn't recieve praise, what I meant was he is stuck most of the time making fantasy pieces. And because of this many people may not regard him among other well known smiths like Evans, Powning, and Cashen. If he does one more Narsil style pommel I think John's going to lose it! I never said he didn't recieve praise, what I meant was he is stuck most of the time making fantasy pieces. And because of this many people may not regard him among other well known smiths like Evans, Powning, and Cashen. If he does one more Narsil style pommel I think John's going to lose it! Like the other comments here, I'm not sure if John is or is not considered a legitimate maker of historical swords or not. I suspect that would depend on who you ask. Regardless, John has certainly made a hell of a reputation for making inspired fantasy-based pieces that are both artistic and functional. The solution to your dilemma isn't that mysterious really. For any maker to be considered a viable choice for quality historically-based reproductions, that maker needs to, well, make historically-based reproductions. To do this, research and study need to happen: not just on profile and general appearance, but a careful study of blade geometry, proportion and volume, line and proportion, and especially the subtlety that is often overlooked by most modern-made pieces. To do this justice one must have access to a very large library of books, hands-on study of originals, the ability to recognize the various criteria from that input, and lastly, a command of the techniques needed to recreate it. Even though the process isn't mysterious, it's certainly not an easy one by any stretch. As I think about it, there aren't that many people doing it. Truthfully, it's one of the reasons I started this site. I wanted to put up a place where people can discuss historical arms and armour with the specific intent of broadening people's knowledge of the authentic pieces that are being replicated. I wanted the consumer base to be more educated and better exposed to real arms, and I wanted to encourage the makers to invest in more R&D. While I honestly believe that making a quality sword is a difficult task regardless of the chosen design, I believe that this difficulty is mostly constrained to technique. 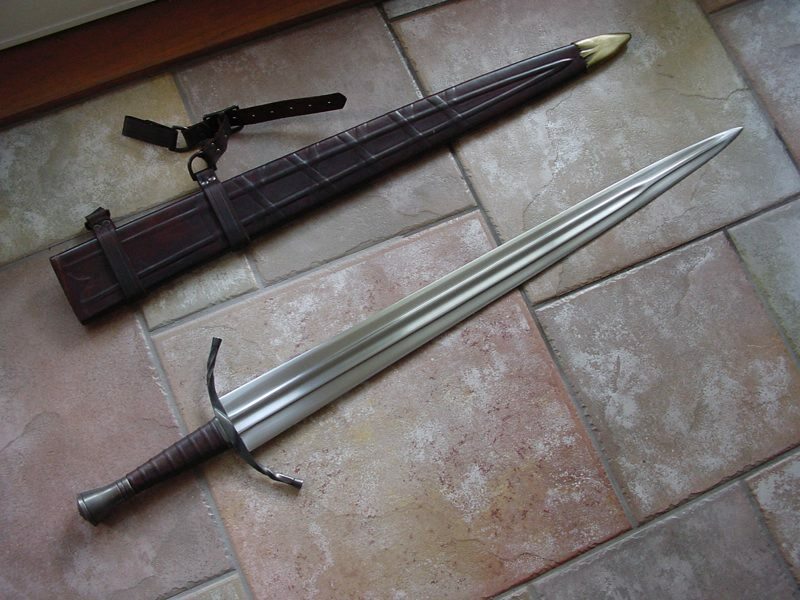 In other words, it takes as much command of technique to make a Conan sword as it does a replica of a Viking sword. But I also believe that to actually replicate an existing piece, one has to add on the difficulty of research, reverse-engineering, and whatnot to the mix. One also needs to understand design, as you would if you were creating a fully new piece, to understand and re-make the originating design. Truly replicating something with all its subtleties is an intensive process. John's an amazing craftsman and artist. I love seeing posts like yours, Aaron, that serve as encouragement to both him and his customer base to focus on additional designs, especially historically-based ones. I hope that the articles that we put out here and some of the things discussed on the forums serve as some help to that end, too. I agree 100% with what Nathan has said, John does do historical swords if you approach him. I approached him about making my hanger/cutlass and it turned out better then I expected. John sat there and studied the original photograph of the sword and made it become a reality again. I've said this countless times, the more swords I keep seeing from the John the better each one comes out looking. Your hanger is very nice Eric. John really has talent, however, if he really wants to get into the recreation of the historic designs he's going to have to get some of the originals into his hands for study. Photos only take us so far. I hope John doesn't get sick of making fantasy swords, as I hope to order one from him one day. I think it is important to appreciate one's own talent. John has an obvious talent for creating beautiful artwork, and why throw that away to copy historical designs? The door swings both ways and there are people standing on either side of it. John has an obvious talent for creating beautiful artwork, and why throw that away to copy historical designs? Actually he does not have to throw anything away, but rather take in that the period weapons have to teach us in order to create historically plausible swords. I would not use the word "copy" as it implies repeating without understanding. I thing that the abilities to make either historical or fantasy stuff are NOT mutually exclusive, so a smith does not have to make ONLY one or the other. so now we know how he could take down all though orcs so easily.